Temple of Olympian Zeus, Agrigento: he’s an atlas, he’s a column: HE’S SUPER TELAMON! 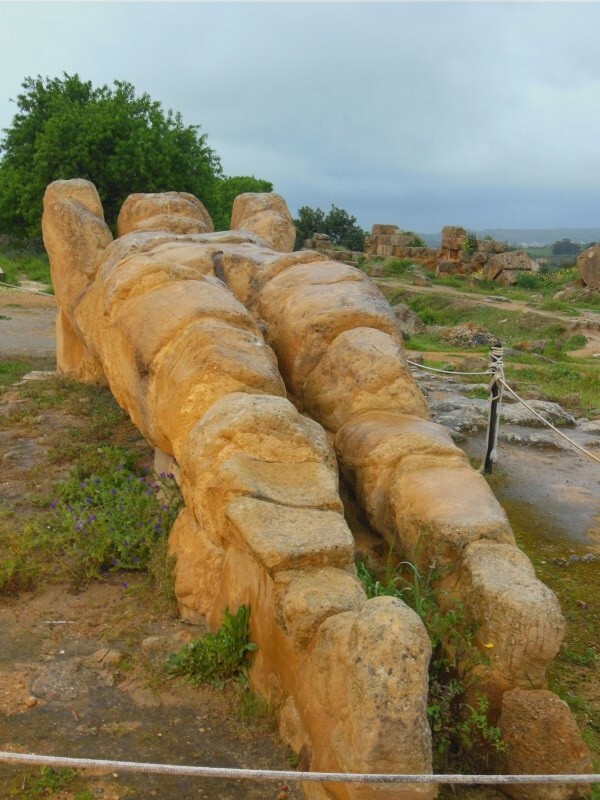 19th century romantics must have gone wild with nostalgic indulgence at the ruins of Temple of Olympian Zeus, in the Valley of the Temples in Agrigento, Sicily. It has such a literal “feel small before the mighty ruins of past civilization” vibe about it. And to my 21st century eyes, the scale and ambition of the temple is massively impressive. But really, I was mostly geeked out about the telemons. The telemons (that’s an architecutural term for Giant Atlas Column Guy) of the Temple of Olympian Zeus were 25 feet high, and that was only half of the height of the temple itself–you can see a model in the pictures below. This was the largest Doric temple ever built, circa 480 b.c. The were originally 38 telemons working on their triceps by holding up the temple’s wall. There are remains of a few telemons still on site, though there’s not much to see of the temple itself since it was destroyed first by an earthquake and later by it’s materials being used as a quarry. 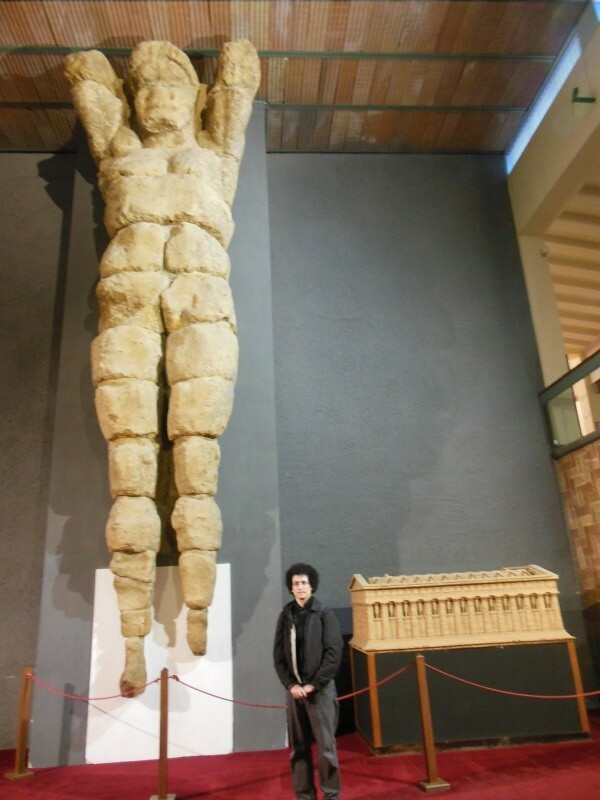 To fully understand the ruins of the Valley of the Temples, you should visit the excellent Archeological Museum of Agrigento, since many of the finds from the temples and surrounding areas are there. Warning: the museum’s collection is huge–you need a half a day to even do this place justice. An original telemon, plus a few telemon heads, along with a helpful reconstruction of the temple, is in the museum’s galleries. How we got to Agrigento: train from Cefalù. Where we slept: B&B Camere a Sud. Price: €59 for a double. Recommended: yes. HOB with an original Atlas and a cork model of the temple (in the archeological museum of Agrigento). Telemon in situ at the sight of the temple ruins. A reproduction of the temple. The telemons were just the upper part of the columns–think of how huge this temple must have been! 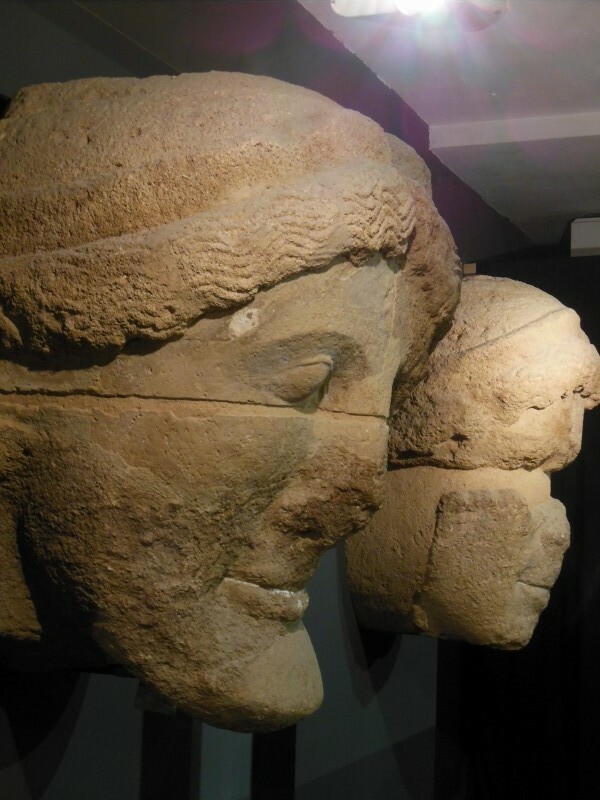 Original heads from the telamons in the museum. 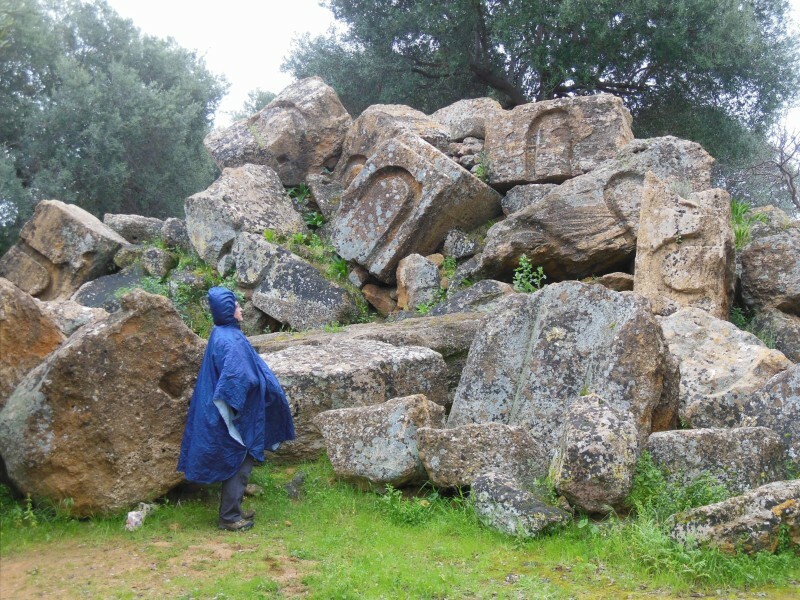 The Infamous Blue Traveling Poncho contemplates the ruins of the Temple of the Olympian Zeus.